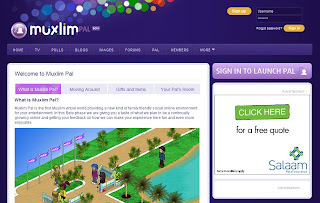 Service on the virtual world increasingly crowded with releasing new first website specifically Moslem in the world made by a company called muxlim.com finland origin, titled muxlim pal service is designed for moslem who is live in western countries and want came with the other moslem online. Here, users can create personal data,designing their own rooms, purchase virtual goods such as clothes or furniture for titivate avatars and to interact with other users.Not only that you can also read news publication of al-jazeera,fun in the cafe, the beach, worship in the mosque, visit the concert, to listen and read al-quran. of course you do not need to pay anything to register and enjoy all of that. Lately, computer users and the operating system with apple logo become popular. Since Apple.Inc signed agreements with Intel.Corp to use the x86 processor family, the popularity of the Apple Macintosh Mac OS abbreviated increasing. Mac OS users also began mushrooming on the internet, from the forum, mailing list, to a website that provides an application specifically for Mac OS. One of them is the website Freeware OS X with address at www.freewareosx.com. This website collects freeware, best freeware, designed specifically for Mac OS X. Freeware OS X is still quite new,But they promised to continue to develop this website, free continue to add new freeware each day. 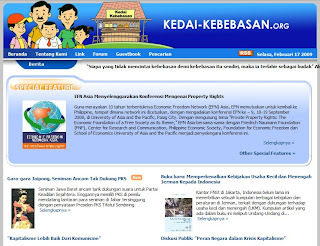 Store habits in www.kedai-kebebasan.org is an online interactive forum, arena to exchange ideas for the individual who believes in the importance values of freedom, that is applied to the world economic, political, social, and cultural. Freedom and prosperity are the two keywords, such as the withdrawal of the two currencies that complement each other. Welfare will not be realized,if there is no freedom of the individual in the field of economic, political, social, and cultural. Meanwhile, freedom will have no meaning if in the end not provide for the welfare of each individual. However, the same can not be denied on the creation of justice as a necessary bridge between them. In the beginning the Internet was built for the purposes of military communication. However, the growth would occur when the Internet was introduced to the public interest. In addition to the business, the engine that drive the rapid development is role of community. History has proved that the existence of the community in the virtual world can not be seen next to the eye. The more and active community in the virtual world as consequently the rapid development that can also be reach in a relatively short time. 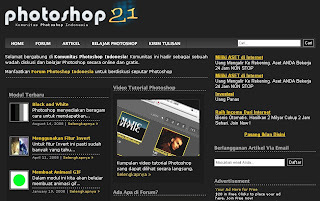 In Indonesian, some operating system or application user community start himself appeared. One of them is the photoshop user community. RevieWeb Inc. is our Website for everyone. We'll help you explore many sites in the world and get new information from there. Hope you'll enjoy this site.